Are they right? Well, that’s a great question, and perhaps we can get to the bottom of that another day. For now, though, we’re getting ready for Father’s Day, so let’s take the old man at his word, and try to close the gap between our driving skills and his, with four simple tips for driving like dad does. 1. Care about your car. One of the dads in our office says “The only thing dad cares about more than the kids is his car,” and it’s definitely crucial for you to make taking care of your car a priority. There’s no shortage of valuable tips for car maintenance out there, but a few basics are below. Tend to your tires –first, check tire pressure: properly inflated tires are safer and even save you money on gas , and after you’ve taken care of this, use a penny to check your tire’s treads! 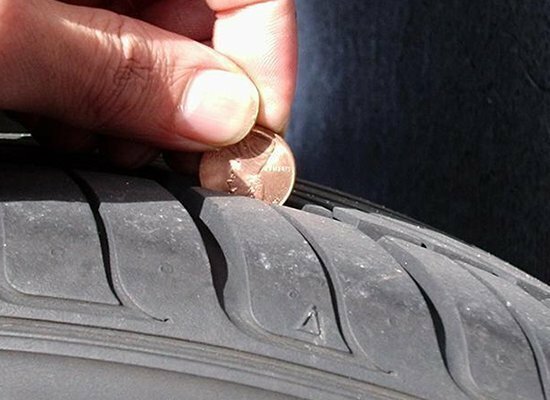 Check the tread on your tire with a penny! No, we’re not kidding: you can use a penny to check to see if your tires are worn. Simply put the penny into the groove of the tire, with Lincoln’s face toward you, and the top of his head pointing to the center of the axle. If you can see all of Lincoln’s head while looking from the side of the tire, your treads aren’t deep enough, and you need to replace your tire. You already know that distracted driving is a big problem, but what you may not know is that some of the worst distractions are a little bigger than a cell phone, and a lot harder to put into the glove compartment. It turns out that passengers can be nearly as distracting to a driver as a cell phone ! What this means is that you need to get in touch with your inner dad and make sure any passengers you’ve got are keeping quiet and not interfering with your driving. Of course, this goes both ways: when you’re a passenger, make sure you’re not distracting the person who’s behind the wheel. 3. Remember what’s most important. Driving is a little like being a dad: it’s a tremendous privilege, and one that comes with great responsibilities. When you’re driving, just like when you’re a dad, you’re never alone. Everything you do has consequences for those around you. And, just like being a dad, driving can be a heck of a lot of fun! To drive more like a dad, just keep your responsibilities in mind when you’re behind the wheel. Follow these simple tips for driving defensively, and maybe next year we’ll add “Teen Driver Day” to Mother’s Day and Father’s Day. Stay alert and ready to yield to avoid a collision–or worse! 4. Get good at what you’re doing. Nobody ever said driving would always be easy. That’s why it’s so important to start off with a good foundation in defensive driving , and doubly important to practice diligently. Master the following skills, and you’ll be as good as your dad in no time. Know the speed limit–and follow it! Keep a three-second following distance –at least! Okay, that’s it! We hope you enjoyed this quick roundup of driving like dad–or, at least, driving like dad thinks he does! If you’re interested in more great tips for better driving, start with our Top Three Mistakes Student Drivers Make and don’t forget to sign up for our newsletter, which will pour tips like these and much more into your inbox every month! Thanks, happy Father’s Day, and drive safely!